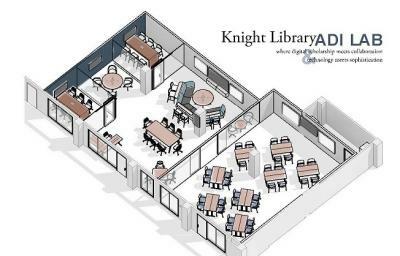 A vibrant new learning space is coming to the Knight Library Academic Commons! Set to open in Fall 2018, the Academic Design Innovation Lab (ADI) will be a shared space for innovative teaching, experimentation, and consultation for digital scholarship, research data management, and use of primary-source materials and artifacts for teaching, learning, and scholarship. Digital scholarship meets collaboration; technology meets sophistication!